Recipes matter, but not all recipes and not always. That is a little of what I’ve learned during 20 years of writing cookbooks. When I started working with Weber long ago, I identified more with chefs than with home cooks. 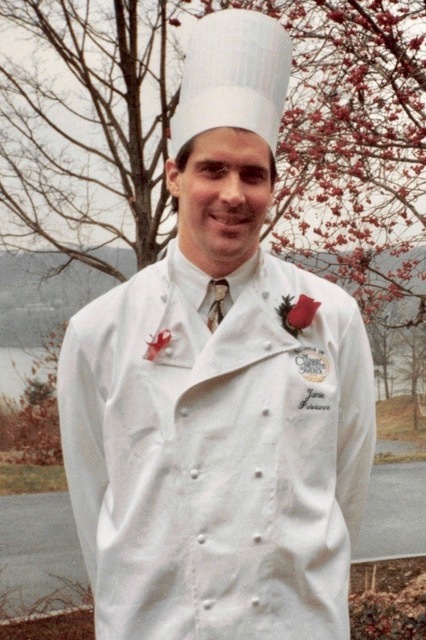 I had graduated from chef training at the Culinary Institute of America and had cranked out a lot of food in fast-paced restaurants. Like most chefs, I didn’t cook from recipes. Chefs just cook. They develop a certain feel for ratios of let’s say, vinegar to oil in a salad dressing, or salt to sugar in a dry rub. You won’t often find top chefs measuring with teaspoons or setting timers. That’s me many moons ago, on graduation day at “the other” CIA. It turns out, though, that recipes can be great starting points for developing a feel for how to grill. Following a properly written recipe is like following GPS directions in your car. The first time you drive somewhere new, the directions are really helpful. After that, you might not need them so much. You might rely more on your memory or just a feeling for where you are heading, even if you are not following the same route exactly. That’s what we try to do with the Weber cookbooks: Give you reliable directions for how to get someplace (or something) great. Doesn’t every cookbook do that? Actually, no. A lot of cookbook recipes – and especially Internet recipes – are notoriously unreliable. They might work for the chef or author who made them once, but they are rarely tested by others, so many of the errors and omissions that never occurred to the author are left inside the recipes. Uh-oh…. Before any recipe makes it into a Weber cookbook, it is tested at least three times – and each time by a different person. Three people reading the same recipe will almost always read it and make it differently. By testing the recipe again and again, we account for various interpretations and we refine it to be clear and reliable for all kinds of grillers. This week we are publishing the greatest (and most reliable) collection of grilling directions ever. I know, that’s saying a lot, but I’m not the only one saying it. 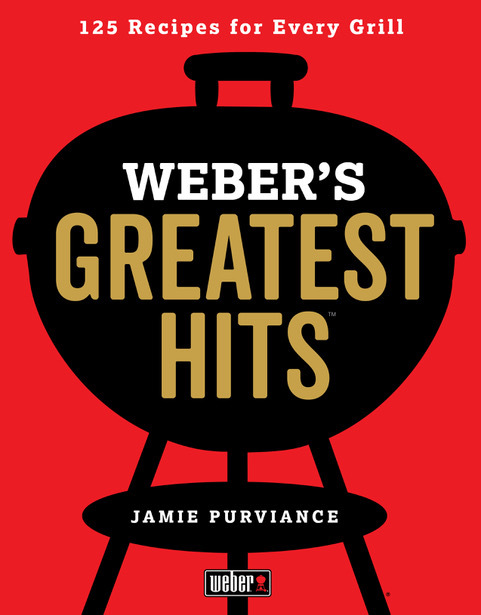 "Weber’s Greatest Hits” features 125 all-time favorite recipes as selected by Weber fans and experts. 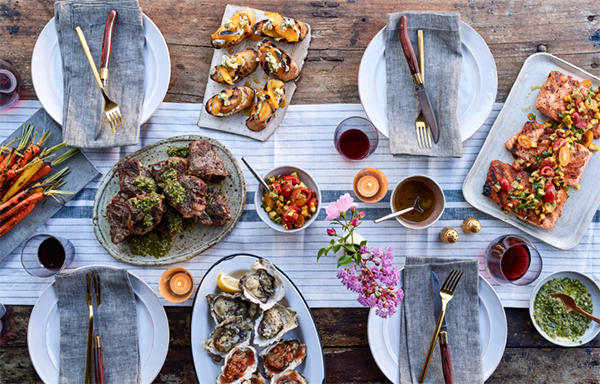 This party menu features Grilled Oysters with Four Sauces, Peach and Blue Cheese Bruschetta Drizzled with Honey, Lamb Loin Chops with Lemon-Mint Salsa Verde, Salmon Fillets with Roasted Corn Salsa, and Grilled Carrots with Spiced Butter. To learn more about this exciting new collection, click over to the cookbook section here. But before you go, remember this. Recipes matter because they can get you where you want to go, assuming you can trust them (which is not always true). After you been there once successfully, it’s really up to you how you get there again. You can follow the same directions or come up with your own way based on a well-guided feeling. That’s when you are grilling like a chef. “I hate you, Jamie Purviance! Just as I was making a list of my favorite recipes for my next book, you published most of them in this book. If a cook wants the best recipes for the backyard, here they all are between two covers. And such beautiful photography. What an accomplishment!